Fears that terror bombers could target Mumbai after Bangalore and Ahmedabad caused scores of Mumbaiites to stay indoors over the weekend, although people were trickling in to work today. The two vehicles found packed with explosives in Surat bringing the diamond city under terror radar were recently stolen from Navi Mumbai. The Congress and the BJP have started sparring on the recent bomb blasts in Bangalore and Ahmedabad with each subtly hinting at the involvement of the other. The NDA at a meeting of its parliamentary party leaders at the residence of L.K. Advani today decided to participate in the seven-member panel setup by the Speaker to look into the scam. The NDA also decided “not to move a no-confidence motion” in the coming monsoon session of Parliament, NDA spokesperson Sushma Swaraj said. The UPA government is toying with the idea of postponing the next session of Parliament that was slated to begin on August 11. However, a final view in this regard could not be taken at today’s meeting of the Cabinet Committee on Parliamentary Affairs (CCPA). The station master of the Laksar railway station, near here, today received a letter from a militant outfit threatening to bomb prominent railway stations in Uttarakhand and Uttar Pradesh. raids and detained several persons for questioning. With the communists off its back, the Indian government is fast-tracking three key military pacts with the US, including one under which their armies can refuel ships and aircraft in cashless transactions that are balanced at the end of the year. Kishore Samrite, a Samajwadi Party legislator from Madhya Pradesh, on Monday sacrificed two buffaloes and over a 100 goats at a famous Hindu temple here to seek divine blessings for the party leaders who lent support to the United Progressive Alliance (UPA). Responding to the growing concerns over global warming, the Northern Railway is now going to contribute its bit to environment by introducing an ozone-friendly air conditioning system in trains. India has sought the help of western foreign intelligence agencies to unveil the identity of the terrorist group responsible for last week’s serial blasts in Bangalore and Ahmedabad. The CPM today claimed that a “glaringly iniquitous” draft agreement was being forced on developing countries at the WTO talks in Geneva and asked the UPA government not to fall prey to the US “pressure” on the issue. It has been over a decade since the Supreme Court took suo moto cognisance of continuing unruly traffic on roads and resultant deaths and gave a landmark judgement for bringing order by ensuring speed limits on Delhi roads. State-run NHPC Ltd plans to invest Rs 28,000 crore in the XIth Five Year Plan (2007-12) for adding 5,300 MW of power generation capacity. Scales that protect a quarrelsome fish from the bites of its own fellows as well as from predators may hold the key to the armour of the future, US researchers reported. The light, multilayered design of its scales has helped the fish survive for 96 million years, the team at the Massachusetts Institute of Technology, reported on Sunday. Writing in the journal “Nature Materials”, they had figured out how it works. The Cabinet Committee on Economic Affairs is likely to discuss this week an investment policy for urea sector that promises higher remunerative prices with a view to increase the production by 10-15 per cent in short term. Mumbai’s civic body, the Brihanmumbai Municipal Corporation (BMC), has unveiled an ambitious proposal to network the entire city and its suburbs so that anyone with a laptop or a computer can access the Internet on the move. The CPM leadership in Bengal will wait for Somnath Chatterjee to react on his expulsion from the party and then consider if any attempts are to be made for his return, party sources said. The Supreme Court today admitted a petition questioning the constitutional validity of a legislation providing annual financial assistance to Muslims going on the Haj. A total eclipse of the sun will occur in the afternoon of August 1. The eclipse will be visible as a partial eclipse throughout India. The total eclipse will be visible in the region covering northern and eastern parts of North America, Greenland, northern Europe and Asia except Japan. Senior BJP leader Jaswant Singh today agreed that a POTA like legislation was necessary to contain terrorist acts in the country. German foreign minister Frank-Walter Steinmeier today condemned the terrorist bombings in Bangalore and Ahmedabad last weekend, in which around 50 persons were killed and more than 150 injured, and hoped that the culprits would be brought to justice as soon as possible. Congress president Sonia Gandhi and Gujarat Chief Minister Narendra Modi maintained a clear distance from each other today during their entire visit to the serial blast victims. Taking serious view of obesity and high blood pressure among flight crew, the directorate general of civil aviation (DGCA) has come out with detailed medical guidelines that have to be followed before they undertake flying duties. A large number of Border Security Force (BSF) jawans, who were medically boarded out of service after being injured in various counter-terrorist operations, are now fighting to get the benefits of their insurance cover. Kalawati Bandurkar, the Maharashtra-based widow with nine children, whose grim plight was narrated by Congress MP Rahul Gandhi in the Parliament would be “adopted” by a leading non-government organisation. To probe the corruption cases against Chief Minister Mayawati the arch rival Samajwadi Party (SP) today passed a resolution demanding the Centre to set up a three-member Supreme Court judges committee. Shopping malls and movie theatres also reported thin attendance over the weekend. “The crowds were less on Sunday although we were having an end of season sale,” an assistant at the Dahisar outlet of Star Bazaar said. The Fame multiplex in suburban Andheri also witnessed lesser crowds although the area is generally packed with youngsters on weekends. In many parts of the city police randomly checked vehicles. At railway stations scanners and X-ray machines have been installed to check the baggage of passengers. 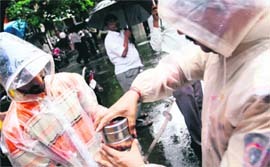 On Sunday, Maharashtra’s Deputy Chief Minister R. R. Patil travelled by a local train to instill confidence among people. Meanwhile, Mumbai police have decided to crack down on people who rent their houses without informing the police about the identity of tenants. An email claiming responsibility for the blasts, allegedly sent by the Indian Mujahideen to various television channels, was traced to a flat in Navi Mumbai yesterday. An American couple has been living in the flat for more than six months, but their tenancy has not been registered. Although police officials confirmed that the email of the American national was hacked, the couple from Delhi who own the flat have been called for questioning. The broker who got the tenants for the property is also being questioned. “A Wagon R car found in Surat was stolen on July 8 from Vashi while a Maruti 800 car was stolen from the Sanpada area on July 15,” a senior Mumbai police official said today. Both cars were stolen from the parking lots of the buildings of the owners and both belonged to businessmen, the official said. The owners of the respective vehicles had filed complaints with the Navi Mumbai police stating that the cars had been stolen, he said. The police said the number plates of the two cars stuffed with powder materials, gelatin sticks and shrapnels were fake and were of two-wheelers. “We have not found any leads into who was behind the planting of explosives in the Surat city. But several people have been detained for questioning,” Police Commissioner RMS Brar said today. The explosives were sent to a forensic science laboratory for testing, Brar said. The two cars had number plates from Vadodara city. “On investigations we have found out that all the number plates are of two-wheelers. They (terrorists) used fake number plates to mislead the police,” Brar said. While senior BJP leader Sushma Swaraj hinted a government conspiracy to “divert attention from the cash for votes scandal”, AICC general secretary Digvijay Singh remarked at the “uncanny timing” of the blasts. The former chief minister of Madhya Pradesh said, “I don’t want to sensationalise the issue. I don’t want to indulge in blame game, but it is a fact that the BJP/VHP let go no opportunity to divide the society on communal lines between the Hindus and the Muslims. The NDA at a meeting of its parliamentary party leaders at the residence of L.K. 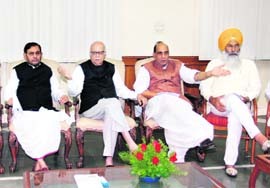 Advani today decided to participate in the seven-member panel setup by the Speaker to look into the scam. The NDA also decided “not to move a no-confidence motion” in the coming monsoon session of Parliament, NDA spokesperson Sushma Swaraj said. She also said the NDA was not happy with the seven-member panel Lok Sabha Speaker Somnath Chatterjee has constituted to investigate the complaint. Sources said the controversial tapes the BJP has been demanding to be made public have been handed over to the committee. The CCPA, headed by external affairs minister Pranab Mukherjee, met today, but the discussions were inconclusive as Union ministers Sharad Pawar and Ram Vilas Paswan, who are also members of this panel, could not attend because they were travelling. The meeting was also cut short as Mukherjee was to take the afternoon flight to Tehran. Government sources, however, indicated that the next session may not be held on August 11 as decided earlier as several UPA allies did not want another run-in with the Opposition so soon after last week’s two-day session called especially for the trust vote. Parliamentary affairs minister Vayalar Ravi maintained that though the CCPA had decided to commence the monsoon session on August 11, the government did not communicate its decision to the President as it was overtaken by events and had to convene a special two-day session for the trust vote. Ravi said the schedule for the monsoon session would be taken up at the next CCPA meeting, which may now be possible on Pranab Mukherjee’s return from the SAARC summit in Colombo on August 3. UPA sources admitted the government was keen on deferring the session as it could prove to be an exercise in futility because the Opposition was unlikely to allow any business to be conducted. Besides the BJP, the UPA would also have to face the wrath of belligerent Left parties. The communists as well as the NDA are smarting after their defeat in the trust vote and are waiting to put the government on the mat at the first possible opportunity. The monsoon session is generally devoted to legislative business and though the UPA government would like to push through its stalled economic reforms agenda, it may not be possible as the ruling coalition does not have the numbers to do so. The UPA will require the BJP’s cooperation for the passage of the banking, pensions and insurance Bills, which were blocked by the Left parties, but the main opposition party appears to be in no mood to oblige. Parliamentary affairs ministry sources said last week’s two-day session was notified as the 14th session of the 14th Lok Sabha and the Constitution lays down that the gap between two sessions should not be more than six months. It was stated that since the House had not been prorogued but adjourned sine die, the next session would be a continuation of the last one. Only when the House is prorogued that the government is required to notify a fresh session. The letter threatens to carry out a blast at the Laksar railway station in Uttarakhand while threatening to bomb Muradabad, Kanpur, Sharanpur, Bareli and other major railway stations in Uttar Pradesh on Independence Day on August 15 and on Janamashtami. Sources said a letter addressed to the Laksar railway station master was received around 11 am today, bearing stamp of July 28 as the date of postage on its face. The letter categorically threatens Uttar Pradesh and Haryana police to be ready for bloodshed, mentioning “Haryana aur Uttar Pradesh police khun ki holi ke liye tyar rahe”, said sources. The letter also mentions that Dehra Dun and the celestial city of Hardwar would also witness attacks in the near future, sources added. The officials concerned have been directed to get ready the anti-bomb disposal squads in order do deal with any eventuality. He urged people to remain alert and inform the police on seeing any suspicious activity or object. Abdul Halim, an operative of the banned SIMI, who have been arrested in connection with the serial blasts, was today remanded in police custody for 14 days by a court here even as cops conducted raids and detained several persons for questioning. Halim, who is also accused of recruiting people for jehadi activities after the 2002 Gujarat riots, was sent to police custody by Metropolitan Magistrate G.M. Patel on an application moved by the crime branch of the city police. Joint Commissioner of Police (Crime Branch) Ashish Bhatai, who has been heading the blasts probe, said Halim had been questioned by the security agencies. Halim was the first person to be arrested yesterday in connection with the 16 blasts that killed 50 persons. Bhatia said raids were conducted in different part of Ahmedabad by the police last night and many people were detained for questioning. The crime branch is also tracking cycles used in the serial blasts held in the city on Saturday. As per police sources, most of the cycles used in the blasts were second-hand ones. The police questioned some of the cycle dealers of the city to find a lead, the sources said. Apart from the Logistics Support Agreement (LSA), the other pacts pending are the Communication Interoperability and Security Memorandum of Agreement (CISMOA) that will enable the two armies communicate on a common platform, and an end-user agreement governing the sale of US military hardware to India. These pacts have been in the limbo for long due to the objections of the Left parties over the warming India-US military ties. With the communists having withdrawn their outside support to the government, which subsequently won a trust vote in Parliament, the way is now clear for inking the agreements, a defence ministry official said. “The LSA would require both countries to provide their bases, fuel and other kind of logistics support to each others’ fighter jets and naval warships,” the official told IANS, speaking on condition of anonymity. Explaining the advantages of the agreement, the official said: “India will have to spend close to Rs 100 crore for participating in the Red Flag exercise (with the US Air Force next month). “Had an LSA been in place, India would not have had to physically pay the money but would have provided reciprocal facilities in this country whenever the US defence forces required them,” the official added. India’s ambassador to the US Ronen Sen had met defence minister A.K. Antony here on July 24 to discuss various India-US pacts that were in cold storage. The US has agreements similar to the LSA in place with some 65 countries. In most cases, it is called the Acquisition and Cross Servicing Agreement (ACSA) that was formerly known as the NATO Mutual Support Act. It was enacted to simplify exchanges of logistic support, supplies, and services between the US and NATO forces. It was amended in 1986, 1992 and 1994 to permit ACSAs with non-NATO countries. With the Indian and US armies increasing their engagement in war games on land, in the air and at sea, CISMOA has become a necessity to ensure there are no communication glitches. “With the increasing number of military exercises between the countries, the pact is set to be given the green light soon,” the official said. As for the end-user agreement, India has so far refused to sign it in its present form and has asked for modifications. “It’s like this: we purchase, say, night vision goggles from the US and deploy these on the LoC (Line of Control in Jammu and Kashmir). Obviously, we cannot allow US inspectors to physically verify this,” the official said. The legislator performed the rituals at the temple of Mother Goddess Kamakhya amid protests from animal rights groups in the city. "I have come here for blessings for my party leaders and to see that the nuclear deal (with the US) is signed without any hassle. Animal sacrifices here at Kamakhya is a tradition going on for centuries and I think there is nothing wrong in it," Samrite told reporters. Hindu priests performed a special ritual after sacrificing the animals. "The Samajwadi Party legislator wants that his party prospers and wishes for his own well being," said Chandan Sarma, a priest who performed the rituals. Activists of People For Animals (PFA) staged a protest and filed a police complaint against Samrite for cruelty against animals. After using harmful gases for years as refrigerant in AC coaches, the Northern Railway will now be using new refrigerants called R-134A and MO-49. The 150-year-old organisation has been using refrigerant based on dichlorodiflouro methane gas, which is harmful to the ozone layer and causes its depletion. “The dichlorodiflouro methane (R-12) is not environment friendly. If it leaks during breakdowns or accidents, it will deplete the ozone layer around the stratosphere,” a Northern Railways official said. “The new refrigerants called R-134A and MO-49 are more eco-friendly. We have converted 11 coaches equipped with conventional under-slung AC plants with eco-friendly refrigerants,” the official said. The Northern Railway has a fleet of 1,169 AC coaches. Out of 1,169, 302 coaches (116 self generating, 122 end-on generation and 64 generators cars) are equipped with conventional type of under-slung AC plants, which use dichlorodiflouro methane-based refrigerant. The self generating air-conditioned coaches are attached to long distance trains and were 485 in number whereas, the end-on generation coaches are 560 in number and are used in Rajdhani, Shatabdi and Garib Rath trains, the official said. These include America’s CIA and the FBI and their allied agencies that specialize in electronic surveillance the world over. The help of Israel’s Mossad has also been sought. A common thread among these foreign espionage networks is that they have a ‘common enemy’ - Islamic terrorism. Pleased with New Delhi over the nuclear deal, Washington has reportedly assured all help. The FBI had opened its ‘India office’ some years ago to interact with the CBI on various issues related to terrorism, narco-money and laundering of money. Since 9/11 attacks in the US, the CIA has also been interacting with India’s foreign spy agency - Research and Analysis Wing (RAW). 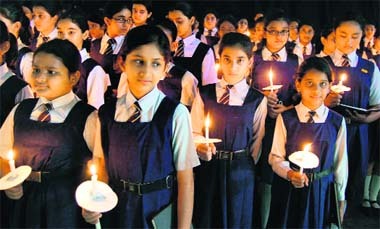 For the Bangalore and Ahmedabad blasts, a little-known terrorist group - ‘Indian Mujahideen’ - has claimed responsibility. The Indian spy agencies believe that by inserting ‘Indian’ in its name the terrorist group is trying to camouflage itself as well as its roots. The significance of Pakistan’s timing on Saturday of placing its premier civil intelligence agency, the IB, and the foreign spy agency - Inter-Services Intelligence (ISI) - under the Interior Ministry has also not been lost in the Indian intelligence agencies. Islamabad’s new regime has unofficially claimed that this has been done in an effort to clip the wings of the ISI, which has been hobnobbing with Taliban and Al-Qaida. The ISI is said to be the major source of most of the terrorist acts in India, including the attack on the Parliament House. However, New Delhi thinks that it is eyewash. A top CBI officer had also admitted that India lacked expertise in crime scene management. “While terrorists were going hi-tech, many states in India continue to be ill-equipped in the area of handling such cases,” he had said. Albeit the American intelligence agencies are now keen to cooperate with their Indian counterparts, the irony is that the CIA was earlier fully aware that the ISI was diverting part of the funds and arms received by it from the US, Saudi Arabia and other countries for use against Soviet troops in Afghanistan, to India to instigate a ‘jihad’ in J&K and other parts of this country. The US then did not alert India about it. “Unfortunately, India lacks the political will to crush terrorism and that is why we continue to witness deadly blasts,’’ feels M.S. Bitta, chairman of the All-India Anti- Terrorist Front. “The US is exerting pressure upon India to fall in line and facilitate the adoption of an iniquitous agreement. US President George Bush has called up Prime Minister Manmohan Singh in this connection. “The UPA government should not compromise India’s stand at the WTO talks in Geneva. Capitulation to the US pressure would amount to another betrayal of national interests,” the CPM Politburo said in a statement here. Since then, a number of PILs have been pending in various states with no concerted effort to address the issue and find a common solution. Speaking at a road safety workshop, union transport secretary Brahma Dutt said India had the dubious distinction of becoming the topmost killer on roads with the number of deaths rising to phenomenal 1.05 lakh in 2007. The Parliamentary committee that comprised 30 members, headed by Sitaram Yechuri, will take up the issue in the coming session.The committee has recommended amendments to the existing car motor vehicle rules, which will be applicable not only for commercial but also to the private vehicles along with two-wheelers. The Centre has recommended the device called speed governor to ensure public safety and prevent accidents. While a Parliamentary committee constituted on April 28 has taken a serious note of the deteriorating traffic conditions and deaths on roads and suggested to enforce the existing Motor Vehicles Act, the state and Central governments have seriously lagged on implementing the existing law. Other than Karnataka, no state government is even aware of any such rules and needs to enforce speed limits in their territories. Goa earned the dubious distinction of first coming out with speed enforcement measures and then withdrawing the same under pressure from the Truckers Association. While most of the other nations, including the European Parliament, had drawn out extensive plans in 2005 to halve the number of road accidents and death figures by 2010, the Central and state governments were going ahead with plans to double the same during the same period. Recently the Central government accepted that accidents and death rates in India had taken over Brazil and China. "We will invest Rs 28,000 crore in the XIth plan period for adding another 5,300 MW capacity," NHPC chairman and managing director S.K. Garg said. The company plans to raise Rs 11,000 crore through its Initial Public Offering and the remaining Rs 17,000 crore via internal accruals. The board members of the company would meet on August 5, NHPC is planning to hit the market for a very long time but the process got delayed due to the lack of six non-official directors on its board, a condition mandatory for a company to go public. It plans to file a revised Draft Red Herring Prospectus with market regulator SEBI next month and is most likely to hit the market in September. "We have identified our sixth non-official director and would submit the revised DRHP with Securities and Exchange Board of India. We are hoping to go public in September," Garg said. Earlier, the company had filed DRHP with SEBI in April last year but it couldn't get market regulator's nod in absence of independent directors on its board. The company plans to pump in another Rs 35,000 crore after the XIth Five Year Plan for further expansion, "We plan to invest Rs 35,000 crore after 2012 for expansion," he said. Each scale is layered so it deflects the pressure of a crunching bite, they said. Cracks do not travel far, the design forces cracks to run in a circle around the penetration site, rather than spreading through the entire scale and leading to catastrophic failure, they added. "The fertiliser ministry's proposal was to come up at the CCEA meeting last week but couldn't be taken up. It is slated to come up for approval this week," a fertiliser ministry official said. Under the proposal, it has recommended international price -parity for the domestic urea manufacturers. However, a maximum cap price of $425 per ton will be taken into consideration for payment of subsidy by the government. This is better than present consideration of $350 per ton. "There is no investment in the fertiliser sector for the past 15-20 years. The production capacity has not increased but the output fell because of closure of some plants. So there was a need for a policy to attract high investment in fertiliser sector," the official said. However, the WiFi services will not come free of cost as it does in some Scandinavian cities.The corporation officials said service providers contracted to provide the service would be allowed to levy a monthly fee from subscribers. Next month, the corporation will float global tenders to install towers across the city and the suburbs so that Internet is available within municipal limits of Mumbai. Additional municipal commissioner Anil Diggikar said it would be a public private partnership project whereby the selected service provider would be allowed to put up towers and other infrastructure on civic properties in return for profit sharing with the civic body. In Maharashtra, the Pimpri-Chinchwad municipal corporation (PCMC) next door to Pune, has already kicked off a WiFi project. The BMC has already got a feasibility study done by Tata Consultancy Services.”We expect the project to be completed in a year’s time,” says Diggikar. The party secretariat did not meet today at Alimuddin Street to discuss Chatterjee’s issue. But some senior leaders informally discussed his role as speaker vis-à-vis the politburo’s decision to sack him from the party without giving him any opportunity to defend himself.Prakash Karat also hinted before leaving the city yesterday that there was scope for Somnath to return as per provisions of the party’s Constitution. Jyoti Basu and several other senior leaders did not like the manner in which such a senior leader was expelled without being issued any show-cause notice. Basu also wanted Biman Bose and Buddhadeb Bhattacharjee to hold talks with Chatterjee and bring him back into the party’s fold. Chatterjee today arrived in the city from New Delhi to meet his ailing sister. But soon after landing at the airport, he drove straight to the Raj Bhavan and met the Governor Gopal Krishna Gandhi. Chatterjee’s close aide said it was a courtesy call as the Governor had sent him good wishes on his 80th birthday that he celebrated recently. However, Chatterjee did not meet Jyoti Basu or any other leaders but spent the whole day at his south Calcutta residence with his family. None of the party members also called upon him. Meanwhile, the Left front at a meeting today decided to strengthen their ranks for launching a massive agitation against the nuclear deal and the UPA’s policies. A Bench comprising Justices R.V. Raveendran and L.S. Panta issued notice to the Centre on the petition challenging the Haj Committee Act, 1959 providing special subsidy to the Muslim community for the pilgrimage. The petition filed by Prafull Goradia, a former BJP MP, alleged that the estimated Rs 280 crore annually incurred by the government for funding the Haj pilgrimage was not only unconstitutional but a drain on the tax payers’ money. He contended that the provision for special subsidy to Muslims, without any similar assistance to others like Hindus, Christians, Buddhists and Sikhs, was violative of the Constitution as the state could not discriminate between citizens on the grounds of religion, caste or creed. The special financial assistance to the Haj pilgrims from the tax payers’ money was discriminatory as no such facilities were being extended to Hindus, Christians, Buddhists, Sikhs and other communities. The petitioner argued that other communities too had their own special pilgrim places located in Pakistan, Nepal, Sri Lanka, Jerusalem, Bethlehem, Vatican, Japan, Cambodia and elsewhere but no such financial assistance was being extended to them. Besides seeking declaration of the Haj Act as unconstitutional, the petition urged the apex court to restrain the government from using the tax payers’ money for funding the Haj pilgrimage in future. It also sought a court direction to the government to refund the tax payers their money used all these years for funding the Haj pilgrimages. The eclipse will begin at 1334 hours IST in Canada and end at 1808 hours IST. The total phase begins at 1453 hours IST at a point near southeastern coast of Victoria Island in northern Canada. The total phase ends at 1650 hrs IST at a point near Xi’an in southeast China. The greatest phase of the eclipse with magnitude 1.040 occurs at 1551 hours IST near a point close to Nadym in northern Russia. The duration of the total phase at this point is 2 minutes 30 seconds. In India partial phases of the eclipse will be visible. In Amritsar eclipse will begin at 1555 hours and end at 1752 hours, Chandigarh 1558 hours to 1754 hours, Delhi 1603 hours to 1756 hours, Hardwar 1600 hours to 1755 hours, Jaipur 1607 hours to 1758 hours, Jalandhar 1556 hours to 1753 hours, Jammu 1553 hours to 1751 hours, Lucknow 1608 hours to 1759 hours, Mumbai 1627 hours to 1803 hours, Shimla 1557 hours to 1753 hours and Srinagar 1549 hours to 1749 hours. Next total eclipse of the sun will occur on July 22, 2009. The path of the totality of the same eclipse will pass through India. The former external affairs and defence minister charged the UPA government at the Centre with “misgoverning” on this count and handling the situation “irresponsibly” for electoral advantage. “You have to create zero tolerance against terrorism. POTA is an instrument for creating this. It is not a political issue or an issue of rhetoric,” he said. Singh alleged that the Congress had aligned with the Maoists in Andhra Pradesh, ULFA in Assam and had created uncertainty in Jammu and Kashmir by its alliance with the PDP, which had association with anti-national elements. He alleged that countries like Pakistan, Tibet and China have been constantly claiming land, which was rightfully India’s. In a communication to external affairs minister Pranab Mukherjee, the German foreign minister said terror and violence were no legitimate means in a political debate. “I sincerely hope that the culprits who caused these heinous attacks will be brought to justice as soon as possible. We cannot stress enough that terror and violence are no legitimate means in a political debate,” he said in the communication. Dr Steinmeier had also expressed sorrow and distress at the incidents, the German embassy here said. Japan also condemned the Bangalore and Ahmedabad blasts as “inexcusable acts” targeted at innocent people, and expressed its resolve to continue its cooperation with India to fight terrorism.“The government of Japan is deeply shocked by a series of bombings in Bangalore and Ahmedabad on July 25 and 26 which resulted in a large number of casualties,” the Japanese embassy said in a statement here. It also condemned terrorism in all its forms and manifestations, and said there could be no justification, whatsoever, for any acts of terrorism. Siddarth Patel who accompanied them said. When they arrived at the City Civil hospital blast site, Modi briefed Prime Minister Manmohan Singh about the blasts that took place at the hospital premises on Saturday killing 23 persons. While, Sonia Gandhi stood in another corner surrounded by state unit Congress leaders, Gujarat Congress legislative party leader Shaktisinh Gohil gave a separate briefing to her about the blast at the hospital. The scene was the same at Vadilal Sarabhai Hospital where both leaders maintained distance. As Modi accompanied the Prime Minister in his car, Sonia travelled in another vehicle accompanied by Congress leaders. Congress leaders said Modi briefed the Prime Minister about the blasts but he kept away from Sonia. Modi, in the past, had made bitter comments against Sonia’s foreign origin. While, in the last Gujarat Assembly elections Sonia had also launched a scathing attack on the style of functioning of the Gujarat Chief Minister. The regulatory authority has laid down mandatory standards for airlines to get blood pressure of crew members checked and also conduct medical examination for obesity. It says if crew member is found to be suffering from hypertension or high blood pressure in tests conducted 24 hours before flying, he or she would be taken off duty. Blood pressure limit of 140/90 is treated by the DGCA as the upper limit. Also those being treated for hypertension would be treated as being temporarily unfit for carrying out flying activities. While acknowledging that there are no standard and universally accepted guidelines to measure obesity, the DGCA said one of the methods to measure obesity was body mass index (BMI), which was a reliable indicator of body fat, as the correlation between body mass and fat was fairly strong. It also opined that BMI and waist-hip ratio were to be taken as parameters for grading and assessing obesity in civilian aircrew rather than height-weight tables. Even though all the jawans affected had paid premiums as required under the Seema Prehari Bima Yojana (SPBY), the subscription of which is mandatory under BSF regulations, they have not been extended the benefits under the scheme. The SPBY is linked with a national public sector insurance firm, under which benefits are paid for death or disability occurring while in service. The jawans have now sought legal redress to their grievance and the matter is pending before the Delhi High Court. According to Rajeev Anand, a former BSF officer now representing some of the petitioners, there are as many as 215 disabled BSF jawans who have not yet received their due insurance benefits. This figure has already been placed before the Bench, he adds. According to one such petition, the jawans were enrolled in the BSF as general duty constables and were deployed in militant affected areas of Jammu and Kashmir. During counter-terrorist operations, they were injured and suffered major disabilities, rendering them unfit for BSF duties. The injuries from bullets, IEDs and grenades resulted in disabilities up to 95 per cent in some cases. One BSF trooper, for example, suffered multiple splinter injuries leading to monoparesis of the right upper limb with deafness in both years. Another jawan suffered from monoparesis of his left arm with weakness of right leg while in another case a jawan suffered splinter injuries in an arm and multiple fractures in both legs. The petitioners have claimed that in spite case files for claim of benefits, supported by all documents and several follow-up letters being sent to the authorities concerned at the BSF headquarters, no action was taken. Several years have passed since their injuries and subsequent discharge. The petitioners have contended that by virtue of being subscriber to the SPBY the premiums for which were deducted from pay of the petitioners at source, and their disability being established being resultant of active operations, they are entitled to disability benefits under the scheme. Sulabh International, which has done some major work in the area of sanitation, has decided to offer Rs 25,000 per month to her family that has been in dire straits after her farmer-husband committed suicide in his village in Yavatmal district of Maharashtra three years ago. “It is a conscious decision to adopt Kalawati’s family,” said Bindeshwar Pathak, founder of Sulabh International, after Kalawati herself threatened to commit suicide, unable to make ends meet. “Monthly financial assistance of Rs 25,000 for the next 20 years will ensure that she is able to take care of her children,” Pathak added. Gandhi had referred to two poor families of Shashi Kala and Kalawati in Vidarbha region of Maharashtra in his speech during the trust vote in the Lok Sabha July 22. Stating that there was no electricity in both their houses, Gandhi had sought to link the power situation in the country, especially in rural areas, with poverty alleviation and the need for nuclear energy. National general secretary Amar Singh announced this at a press conference after the conclusion of a daylong state executive meeting of the party where a resolution to this effect was formally passed. Calling Mayawati “the most corrupt Chief Minister in history”, Singh wondered what was wrong in demanding a probe into her accumulation of wealth between 2003 and 2008. “At least the SP is asking for a probe before demanding action. In Uttar Pradesh we know that action is taken before an inquiry is even ordered,” Singh retorted. Singh mocked at Mayawati’s practice of what he described as the “dry-cleaning the characters of rebel SP leaders”. Illustrating his point, he pointed out that leaders of the ‘Yadav Vahini’ who were criminals when in the SP and overnight turned into saints after crossing over to the BSP. The Yadavs named by the SP general secretary who have undergone BSP supremo’s dry cleaning procedure included BSP MPs Mitrasen Yadav, Ramakant Yadav, Umakant Yadav and MLAs Anand Sen Yadav and D.P. Yadav. However, the otherwise articulate Samajwadi leader was tongue-tied when asked about the possibility of his party joining the UPA government at the Centre. “This is a question that should be addressed to either my leader Mulayam Singh Yadav or Prime Minister Manmohan Singh or UPA chairperson Sonia Gandhi. We have not put up any demand to join the government and at this stage this is a purely hypothetical question,” he maintained.